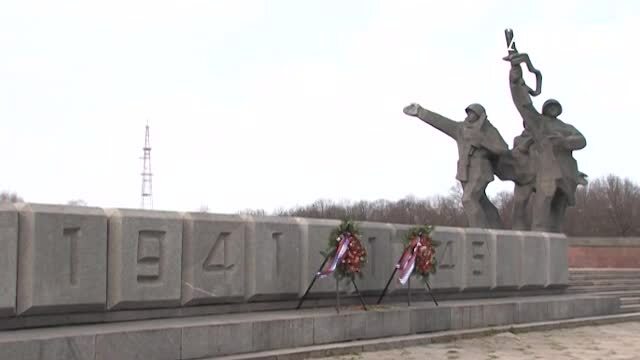 RIGA, October 28 (Itar-Tass) - The memorial to Soviet Liberators of Riga is under Riga city council's supervision so the Sejm, Latvia’s parliament, has no right to decide its fate, Riga’s first mayor of Russian descent, Nils Ušakovs, said in an interview with LNT television channel on Monday. “I am not quite sure the Sejm can make any decision about this monument as it is municipal property. The issues of its erection, name and demolition are to be resolved solely by the municipality,” he said. Parliament may send the municipality a letter with recommendations that will be taken into consideration. Ušakovs pointed to the latest poll commissioned by Riga city council that has shown the overwhelming majority of Riga citizens opposed the demolition. He said their opinion was the main thing to guide him while working in the municipality. “Another poll may be conducted for confirmation,” he added. A Latvian web portal has gathered more than 11,000 signatures in favour of the memorial's demolition. According to Latvian law, an initiative that has gathered no less than 10,000 signatures of full-aged citizens of the republic is deemed a “collective statement” and is to be considered by Latvia’s parliament, the Sejm. In response, a counter-motion was initiated for leaving the monument intact. It has gained almost 7,500 supporters so far. Riga memorial is the main monument for a local Russian-speaking community comprising about 40 percent of Latvia’s population. About 200,000 people gather near the memorial every year to lay flowers and congratulate war veterans. Local nationalists have repeatedly called for demolition of the edifice, erected in the 1980s, though parliament rejected the initiative. The monument has been desecrated several times and even suffered an attempt to blow it up in 1997.